Divorce mediation is way for a couple to resolve divorce issues out of Court. It is a voluntary process whereby the couple and the mediator (and sometimes the couple’s attorneys) meet to identify and discuss the divorce issues. The mediator is a neutral party and acts as the facilitator. The couple works together as they make their own decisions and craft their own divorce settlement terms. What issues are discussed in a divorce mediation session? The costs for divorce mediation are typically much less than divorce litigation. At the Law & Mediation Offices of Karen P. Sampson, Esq., LLC, divorce mediation sessions are “pay as you go”, with payment due at the end of each mediation session. An hourly rate applies. Hourly fees also apply for work conducted by the mediator in between sessions and for the preparation of the Memorandum of Understanding. Please call our office for more information. How many divorce mediation sessions are needed for a divorcing couple to resolve their divorce issues? The number of divorce mediation sessions needed to resolve divorce issues cannot be predicted. 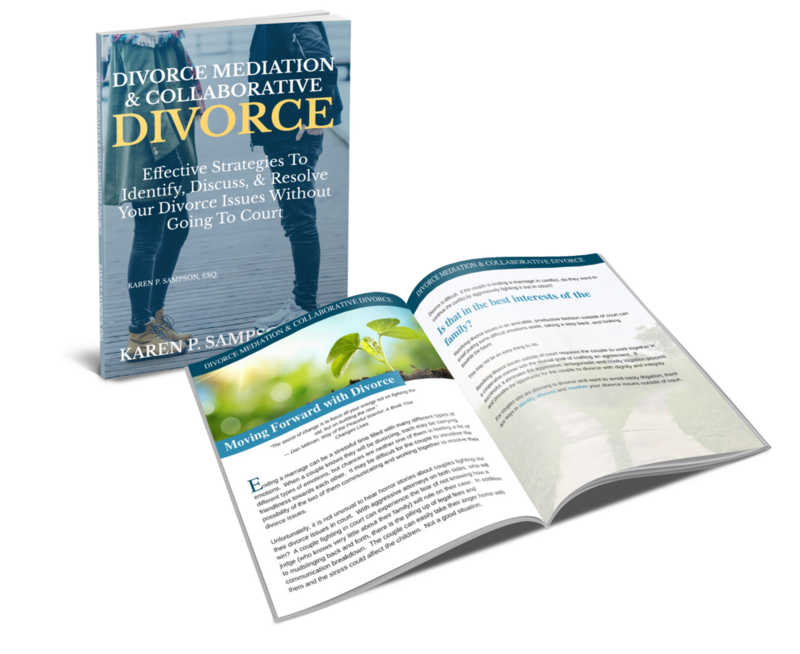 It often depends on the actual issues and the ability of the divorcing couple to communicate and work together at the mediation sessions and in between mediation sessions. Some divorce matters are successfully mediated after 2-3 mediation sessions, others are successfully mediated after 10-12 sessions. It depends on the situation. If my spouse and I are mediating our divorce, do I still need to retain an attorney? As the mediator is a neutral facilitator, the mediator does not advocate for either party. Although t is common for parties to attend divorce mediation sessions without attorneys, retaining an attorney is strongly recommended. The attorney typically consults with the client in between mediation sessions and upon the conclusion of the mediation process. After a successful mediation the attorney typically reviews the Memorandum of Understanding and with the client’s consent proceeds to put the terms into a Marital Settlement Agreement and continue with the divorce process. I think my divorce issues are a bit complex. Can my spouse and I mediate complex issues? Yes, complex divorce issues can be discussed and resolved using the mediation process. Sometimes, depending on the issue, neutral professionals, such as financial professionals or child specialists, may be brought in to a mediation session to assist as needed. The divorcing couple should be ready, willing and able to mediate and work on the issues in a constructive, productive and reasonable manner. What happens after our divorce issues are resolved in mediation? After a successful mediation the mediator prepares a Memorandum of Understanding (MOU) which is a non-binding document that outlines the divorce settlement terms. The parties then typically take the MOU to their respective attorneys for review and upon the parties’ approval, the attorneys put the MOU terms into a Marital Settlement Agreement (MSA) which when signed by the parties becomes a binding document. After that, one of the parties typically files a divorce complaint and proceeds with the divorce. How do we schedule our first divorce mediation session? 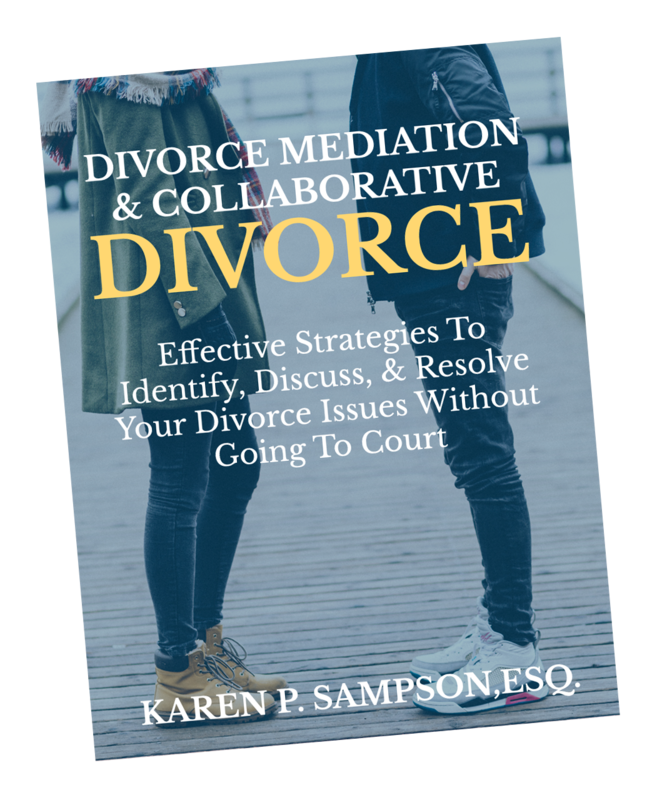 If you and your spouse would like to schedule your first mediation session with Karen P. Sampson, Esq., please call our office at 856-439-0068.